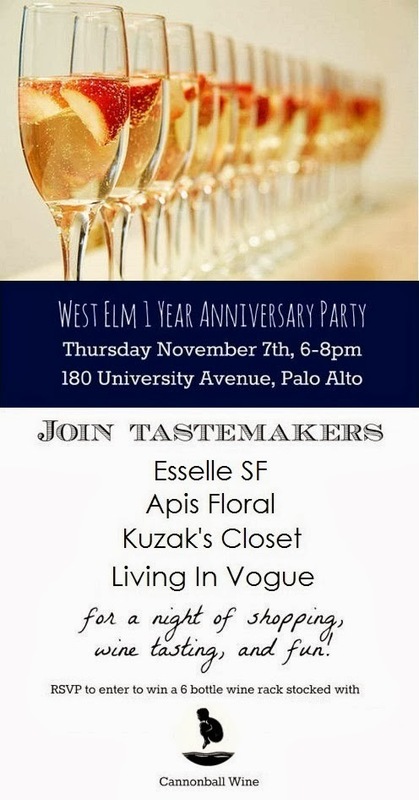 Very happy to have been invited to participate in the West Elm Palo Alto 1st Anniversary Party. I, in partnership with Kuzak's Closet, will be going head to head with Esselle SF and Apis Floral, in a holiday décor contest, styling some great seasonal table looks for guests to enjoy. Attendees will also be treated to some wine courtesy of Cannon Ball Wine, toasting the start of the winter season with West Elm. Join me and Kuzak's Closet to get a preview of our Dressing Up The Holidays event. Save the date for November 21st! RSVP in-store, via West Elm Palo Alto Facebook or by phone (650)329-8086 and win a West Elm White Lacquer Wine Rack filled with Cannon Ball Wine.